Wearing a black tunic with elaborate embroidery made by herself, Liu Ying of the Miao ethnic group is teaching her 11-year-old daughter to sew a dragon pattern in her 9-square meter rented house in south Beijing, as Miao folksongs play on a computer in the background. "It's a shame in our culture if a girl cannot embroider," Liu says. "Miao mothers start teaching their daughters how to stitch when the children are about 5 years old." The Miao embroidery motifs, like those of other Chinese ethnic groups, usually represent a folklore or religious theme. The motifs fall into three categories - geometric, landscape, as well as flower and animal patterns, and come in conspicuously bright green, red and yellow. "The images are inspired by everyday life. The representation is abstract, imbued with great aesthetic value," says Wei Ronghui, deputy curator of the National Museum of China in Beijing. A piece of fine embroidery reflects diligence and shows the family involved in making it is financially sound. "You have to concentrate on stitching as your ancestors are watching you," Liu says. A masterpiece - which sometimes can take three generations to complete - is worn only twice by a Miao woman, at her wedding and funeral. And then it will be passed down to the next generation. "I have preserved the costumes my ancestors handed down," Liu says. "And my daughter will inherit these after my death." Miao embroidery, which dates back to the Tang Dynasty (AD 618-907), was listed in 2006 as a national Intangible Cultural Heritage. 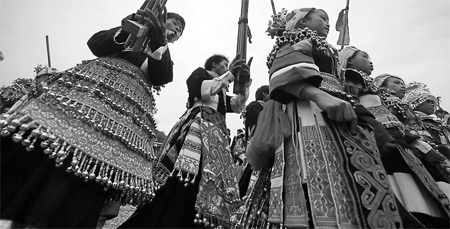 The 9-million-strong Miao are recognized as the fifth-largest of China's 56 ethnic groups. Most of them live in remote villages in Guizhou and Hunan provinces, and Guangxi Zhuang autonomous region in southern China. This ethnic style of needlework can be easily found in big cities such as Beijing and Shanghai, thanks to Miao traders like Liu Ying. In 2000, Liu brought her handiwork to Beijing. "It took me a three-hour bus ride, and five hours or so on the train from my hometown Kaili city, Guizhou, to reach the capital." She now travels the same route every month to purchase embroidery, mostly from workshops in Kaili, and sells them at her two booths in Panjiayuan - the largest antique and cultural items market in Beijing. Machine-made garments sell at 300 yuan ($45) on an average, whereas hand-embroidered ones can cost over 85,000 yuan, depending on the level of craftsmanship and the time taken to finish the product. The price for regular items varies from 100 to 5,000 yuan.